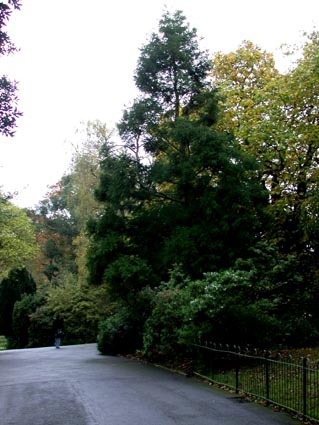 The Japanese Cedar or Japanese Red Cedar or sugi is one of a number of conifers that are called, confusingly, cedars but are not members of the true cedars Cedrus – (see Cedrus deodara in the tree archive.) Cryptomeria is a monotypic genus – there is only one species: japonica. It is a handsome fast-growing large columnar tree with reddish-brown shedding bark and distinctive foliage. 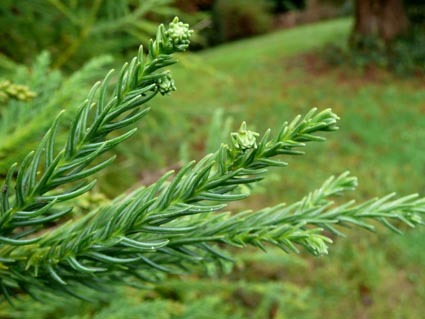 The foliage is the main clue to identification; the only similar foliage is that of the giant sequoia (Sequoiadendron giganteum) whose leaves are less long and more grey-green than the looser awl-shaped needles of Cryptomeria. In both species the needles point forwards towards the shoot tips. Those of Cryptomeria are spirally arranged in five ranks, lustrous dark green, spreading at about 45 degrees. to the shoot. Each has four grey stomatal bands on the under surface. 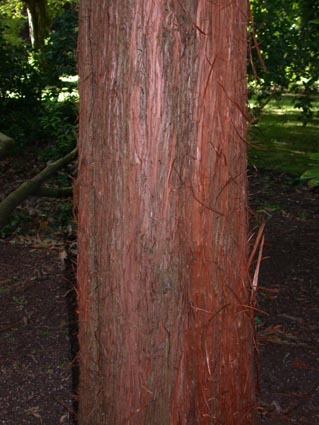 The two barks are easily distinguished too: Cryptomeria has thin stringy bark which peels in thin vertical strips while sequoia bark is thicker and spongier. 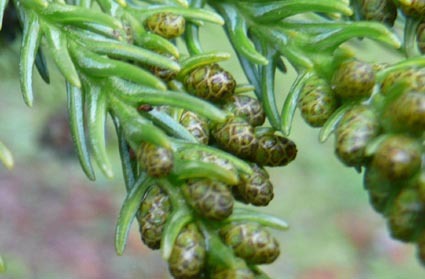 In autumn and winter the young male and female cones, separate but present on the same tree, can be seen: the tiny oval male young cones (stroboli) clustered near the tips of branches, the female green and larger, each little rosette tipping a small shoot. The male stroboli or catkins turn yellow later and shed their pollen in February to March. 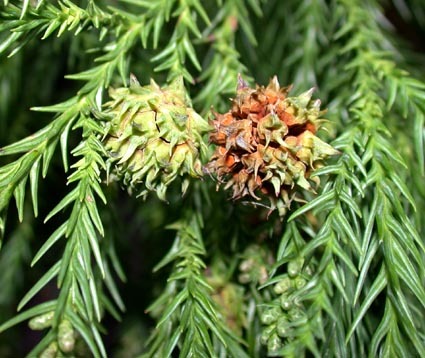 The females develop into cones in their first autumn, green and roughly spherical at first, later drying out to looser brown cones which shed their seeds the following year in autumn. You can often see all of these stages by tracing back up a branch. Valued as a timber tree in its native Japan, where it can reach 50 m in height, it is used for heavy large-scale construction work as well as furniture and fine joinery such as panelling. Widely planted here, it is a popular garden tree across Europe, thriving in a moist soil anywhere that doesn’t have hard winters. Both the type and several varieties are often seen in gardens and parks here including ‘elegans’ which lacks the conical form of the type having a more bushy floppy shape and feathery juvenile foliage which is retained throughout life and becomes a reddish bronze in autumn. The specimen illustrated here is opposite the gate into the works yard in the Botanic Gardens. The trunk of the tree is hidden by a Eucryphia bush (white flowers in September). 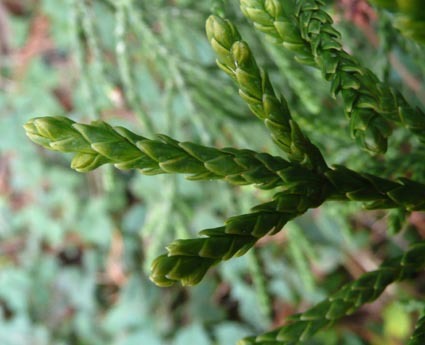 developing female cones of Japanese cedar before fertilisation leaves of sequoiadendron for comparison.